We’ve shown you how to winterize an RV and keep it safe all off-season long. Now, we’ll give you some tips and tricks to de-winterize an RV, so you’re ready to hit the road and get away from it all in the spring. De-winterizing an RV isn’t as hard as it sounds, especially after winterizing one. With these tips, you’ll be ready to go when clear weather and warm temperatures arrive. Depending on your RV, you may need to take specific steps to de-winterize it. Make sure to refer to the manufacturer’s guidelines to add any extra steps to get your RV road ready. The first step to de-winterizing an RV is to charge the RV battery. If you’ve removed it for the season, you’ll want to add it back in and secure it, then charge it. You can also opt to charge it on the ground or in a charging station if you have one available. Do what works best. While the battery is charging, you can work on other de-winterizing steps. The next step is to use the hose; a standard garden variety will do and connect it to your water hookup. Make sure to turn on all faucets in the RV, then turn on the water through the hose to flush the water system. This gets all the chemicals you used to get the RV ready for winter out of the system, so they’re ready to use. You’ll also want to flush the toilet several times, run the garbage disposal if you have one and make sure the lines run completely clear before this step is complete. Then, you’ll want to re-insert the propane tanks in the RV’s propane tank holders. If you have multiple propane tanks, do them one at a time. Attach the propane hoses based on the manufacturer’s guideline for your RV. Now, check all the hoses and make sure you have no leaks or issues with connections. Turn on the propane tank valve slowly, only about a 1/4″ to 1″ open. Use a soapy sponge on the connectors and valve. Watch for bubbles. If bubbles develop, you have a leak and need to replace your line or connections. If no bubbles develop, your hoses and connectors are in working order. Check the battery between each of these steps. Chances are, it’s charged by now and can be inserted into the battery compartment or the hookups taken off and will be ready for use. Make sure the battery is secure in the compartment and hooked up properly. Check the tire pressure, tire wear, and tear, along with any damage or issues on the exterior of the RV. Make sure to check under the carriage, along with one the roof to take care of any problems you may see that developed over winter. Finally, take the RV to a dump station to drain the black, fresh and gray tanks before refilling them with water. Not only will this ready your tanks, but you’ll be able to tell if there’s an issue while driving that may not be apparent when parked. The last real step of de-winterizing an RV is to clean it. 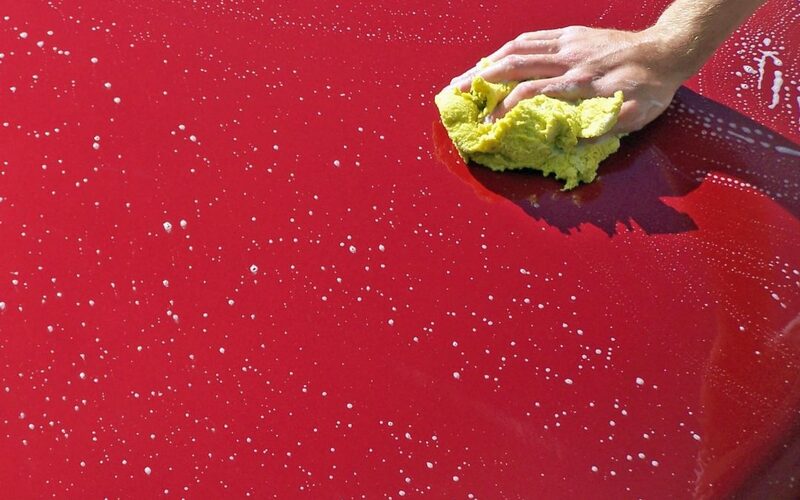 You can run the exterior through an extra-large car wash or do it yourself at home. Make sure to clean all appliances, windows, surfaces and vacuum the interior of the RV. Depending on the layout and space, you may need to perform additional cleaning duties. Make sure to take care of this right away, so you can hit the road from the get-go once you’re ready for your next adventure.